Don’t offer to shake hands; barristers traditionally do not shake hands. It could also get awkward around a table. Listen to the question being asked. Speak slowly and clearly, but don’t be tempted to change your accent in any way. If you need a moment to pause, take it. Have a sip of water. Most chambers will give you an ‘ice-breaker’ question. It will probably be something interesting and non-controversial about you. Many chambers choose such a question to give you a few minutes to settle in. The answer to this question should be straightforward. This author was asked the exact same question at almost every interview. They (uncharacteristically) did not prepare a proper answer to it the first few times. Don’t make that mistake! You’ll probably know what the question is, so prepare a damn good answer to it! Whether you are being asked a question or being challenged during an advocacy/debate exercise, it is imperative that you listen to what the panel is actually saying. You then need to respond to the exact point that has been made (this also works for judicial interventions in court). That means that you identify it for yourself. If in doubt, start the answer by saying “I think the question is this: X Y Z”. You may be wrong but at least you aren’t wasting time. And panels are not perfect. Sometimes they will see that the question was ambiguous and clarify for you. This sounds obvious but interviews are a stressful business and even strong candidates can fall foul of the listening rule. 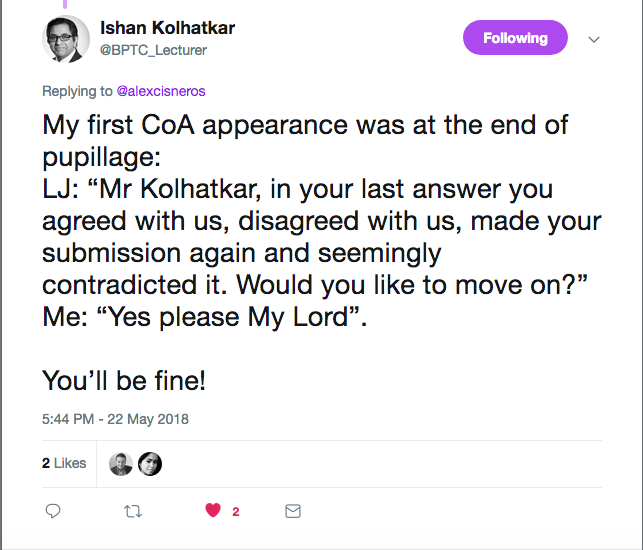 This is also why memorising ‘prepared answers’ often does more harm than good; not only do you appear stilted when you give a prepared answer, but you will most often fall down because you will be responding to the challenges you have anticipated and not necessarily the challenge that you are actually being asked to address. You need to respond to exactly what is being said. The most effective way to do that is to listen very, very carefully. As to “responding”, it is true that there are ways of demonstrating that you are paying attention. Google ‘NLP’. But by and large, authentic reactions are best and if you are genuinely listening, it will show. Don’t worry about sending deliberate signals – you’ve got enough on your plate already. Just don’t be irritating. Don’t nod your head so that you look like the Churchill Insurance dog. Don’t grunt or say “uh-huh”; you are not Elvis. Don’t repeat the last 3 words about a second after they’ve been uttered. Listen in silence. 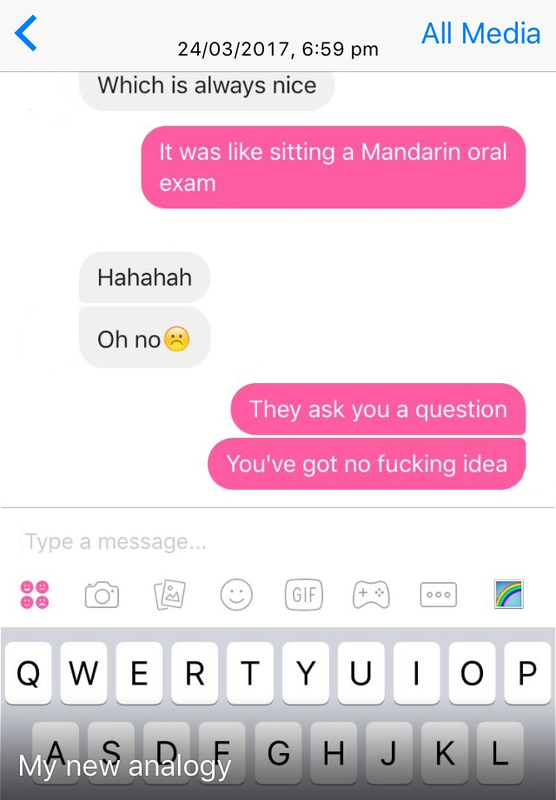 What if you get asked a question and you have no clue? DO NOT MAKE SOMETHING UP! You can start by saying “I’m not sure” and then pivot to something related in your attempt to intelligently answer the question. “If you are asked about a general ‘news’ story and you don’t know anything about it, stay calm. We asked a question about Bradley Wiggins last year but really the question was an ethics one, so for the few people who said they didn’t know much about that news story that didn’t matter. The best candidates were up-front and said they didn’t know the story, but they were also able to identify the point of the question and were able to answer it coherently.” – Barrister, Call 2009. End of the interview: do you ask a question? At the end of the interview, you will usually be asked if you have any questions. The general rule is to say ‘no, thank you’. There are, of course, some exceptions to this rule: if you are asked the ‘any questions’ in a way that is designed to let you tell the panel something you haven’t mentioned yet, take advantage of this. Similarly, if you judge that this would be your only (and best) moment to refer to something new that you’ve done which isn’t on your CV, mention it. Along those lines, a successful candidate recalled that they were interviewed by a panel which included the chambers’ most recent tenant. Their question was about the new tenant’s experience as a pupil; this was well-received, as it demonstrated the candidate’s knowledge of and interest in the set, as well as their desire to understand the kind of work that was available to juniors at that set. Take 5 minutes after the interview to write down the questions you were asked and what your responses were. Do this immediately once you leave the room, or you will forget! These notes will help you assess your own performance if you have to do the pupillage application process the following year. A good idea is to add these to your mega pupillage application spreadsheet in a new column; that way, you’re creating a centralised resource. But my interview went horribly wrong! 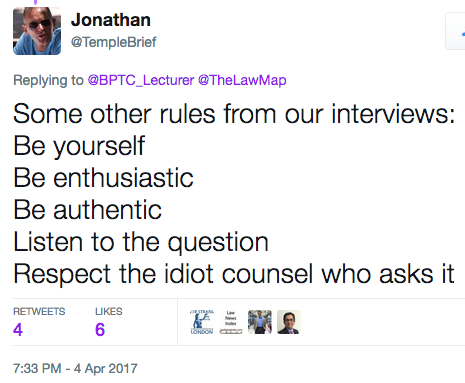 First, we’ve all had train-wreck interviews! Second, don’t forget to write down what you were asked. Finally, it probably didn’t go as badly as you think it did. Sometimes, however, things do go embarrasingly wrong at interview. Don’t worry – it could be worse!